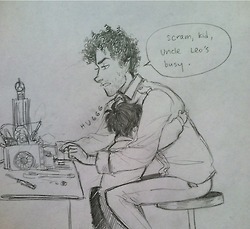 UNCLE LEO WITH LITTLE NICO PART 1. . Wallpaper and background images in the The Heroes of Olympus club tagged: photo heroes of olympus nico di angelo happy geeky little nico leo de valdez uncle leo. This The Heroes of Olympus photo contains anime, grappig boek, manga, cartoon, and stripboek.